Buzzfeed’s food vertical Tastyhas partnered with accessory and watch maker Fossil to create branded cooking videos featuring Fossil’s new smartwatch. Jill Elliott, chief creative officer for Fossil, told WWD the partnership is about “building up” its brand awareness in the young, millennial audience that Tasty attracts. “The whole reason we’re doing this is because the content is so engaging. It’s about getting our name out there … We think we have the opportunity to appeal to a wide age range,” Elliott said. Tasty is known for pioneering short cooking videos based on simple recipes, usually featuring just a set of hands making food from a bird's-eye camera angle. The style is now ubiquitous on the Internet. Called "Behind the Hands of a Tasty Producer," Fossil and Tasty partnered to create three 60- to 90-second videos advertising the new release of Fossil’s smartwatches. 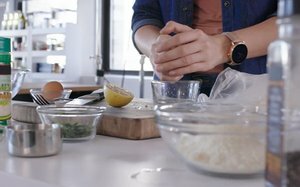 Each video showcases a Tasty producer wearing Fossil’s smartwatch while re-creating their most viral recipes. The videos demonstrate features of the smartwatch that can be used while cooking, like its ability to set a timer, remind wearers of commitments on their calendar and alerts. This is a first for both brands. While sponsored content makes up a fair amount of Tasty’s videos, Tasty has never before partnered with a fashion brand. Fossil also said it has not worked with a non-fashion media partner for its advertising campaigns before this partnership. According to analytics firm Tubular, Tasty’s Facebook video views can total almost 2 billion a month. Its page has nearly 75 million likes. On YouTube, individual videos can attract about 2 million views. Ashley McCollum, general manager of Tasty, said these numbers have helped the channel draw in range of advertising partners. “We’re seeing the interest from a range of verticals [clients]. It’s been pretty overwhelming,” McCollum told WWD. 1 comment about "BuzzFeed's 'Tasty' Partner With Fossil For Branded Content". Steve Climons from Crossover Creative, November 18, 2016 at 12:18 p.m.
Never thought you could have so much style cooking. Functional and fashionable.